How close will these asteroids come to Earth? Kind of. Relatively. One of the asteroids, 2018 CC (named for the year and month in which researchers discovered it), already came and went — on February 6 around 3:10 p.m. EST, it soared past about 184,000 kilometers (114,000 miles) above Earth. The second asteroid, 2018 CB, will swing by Earth today, February 9, at approximately 5:30 p.m. EST. At its closest, it’ll be 64,000 kilometers (39,000 miles) away — just 16 percent of the distance between the Earth and the Moon, which is 384,472 kilometers (238,900 miles) away. That’s pretty darn close. Still, the asteroid is very unlikely to actually make contact with the Earth’s atmosphere, much less its surface. Because the scientists at NASA are sure, and, they’re the people one should trust with this kind of thing. But if you want to know why they’re so sure, it’s because the JPL’s Center for Near-Earth Object Studies (CNEOS) monitors asteroids that come anywhere near Earth. The organization’s Sentry Impact Monitoring System tracks and analyzes information on asteroids that could collide with the Earth. These appropriately-named “near-Earth asteroids” (NEAs) are left on Sentry’s list until an impact can be ruled out. Once the system confirms that the asteroids pose no threat, they’re removed. 2018 CB? Already removed. But why did NASA only discover these asteroids four days ago? NASA probably gets this question often, given that they address it on their Planetary Defense FAQ page. In short, it takes time to observe asteroids and comets, and the ground-based telescopes used to track them down can only be used at night and in clear skies. Once researchers detect these near-Earth objects (NEOs), they predict their trajectories based on early observations. Establishing a good model can take anywhere from a week to a month, according to NASA’s web site. So it’s actually pretty impressive that NASA confirmed that 2018 CC and 2018 CB wouldn’t hit Earth did it even faster, within a week of spotting them. Okay, I can relax for now. But what would we do if an asteroid was expected to hit Earth? The government has a protocol in place to handle threats on a case-by-case basis. NASA’s Planetary Defense Coordination Office (PDCO) in Washington, D.C., is responsible for detecting potentially hazardous objects (PHOs), tracking them, providing accurate and up-to-the-minute information, and coordinating with the U.S. government to plan a response to realistic threats. You can read the agency’s breakdown of a hypothetical scenario presented at the 2017 IAA Planetary Defense Conference (PDC), and you can also check out the app to see exactly what we’d need to do to deflect an asteroid. Will any asteroid ever hit Earth? Unlikely. 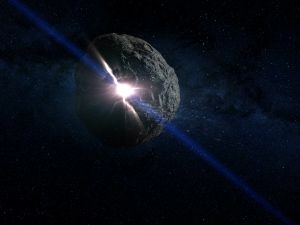 One of the few asteroids that could hit Earth is Bennu, and CNEOS predicts it won’t come close to Earth again until 2135. That approach could change Bennu’s course, putting it in a position to make impact on Earth between 2175 and 2199. There’s only a 0.037 percent chance that impact happens. In other words, there’s more than a 99 percent chance it doesn’t hit. Still, NASA isn’t taking any chances. In September 2016, the agency launched the OSIRIS-REx mission, a probe expected to reach Bennu in 2018 and return to Earth with a sample from the asteroid in 2023. Researchers will use information gathered through that mission to update their predictions. So, yeah, it’s true that 2018 CB is swinging by Earth today, but there’s no reason to let it ruin your Friday via fear of oncoming obliteration. Just keep looking forward to the weekend with the comfort in mind that, at the very least, an astroid impact isn’t coming, let alone, interrupt your ability to see it.